INTIÑAHUI. This is a Quichuan phrase meaning IN THE EYE OF THE SUN. “It is a reference to the intuitive knowledge of archaic cultures and at the same time builds a bridge to our present,” explains Klaus Schrefler, initiator of this interdisciplinary work of art. It all began at a place of worship in the Andes called Ingapirca, facing a symbol of the Sun 3000 meters above sea level. There, enormous chiseled stone ruins still mark the point where the indigenous population celebrated the most important moments of their lives – birth, initiation, and death. It was a place to observe the stars and to interpret the connections between heaven and earth, between macro- and microcosm. Time and again, rites helped to commemorate the life cycle with pictures, rhythms and numbers. Klaus Schrefler - artist and biologist in Graz, Austria - based this project on these rites and myths. Being a traveler and observer, he originally started out to capture his perspectives through photography. In order to account for the permanent flow of life, his visions and pictures urged to be brought to life. To this end 3D-animation seemed to be the medium of choice. In 2001 first sketches for INTIÑAHUI – IN THE EYE OF THE SUN came into being. Like with all his previous efforts, Schrefler conceived his idea as an interdisciplinary project from the very beginning. Years later the project had become an opus magnum with international artists participating, from disciplines such as film, music, performance, and sculpting. The film of 26 minutes represents the center piece of the project, in which a fictional universe is brought to life in sequences created via the help of 3D-animation. The numbers 1 to 9 build the structural backbone of the movie. They were of great symbolic relevance to the indigenous peoples of the Andes and other cultures that have fallen into oblivion. Adhering to this, nine sequences and their associated imagery were conceived. Impressions flow like timeless dreams; endless rooms shrink and grow, the visualization of which demanded years of commitment and thorough technical expertise from Klaus Schrefler and his team. “Creating connections” stands as one of the maxims of the project’s initiator. Consequently the abstract vision of INTIÑAHUI has manifested itself into solid forms by now: Stone sculptures, graphics, and other media supplement the film by creating a multidisciplinary, intercultural oeuvre. Sculptures produced by Ecuadorian sculptor Luis Viracocha prior to the project as well as models by Klaus Schrefler became templates for parts of the animation. In turn, virtual models were transformed into manifestations of stone by Klaus Schrefler and Thomas Siegl. Sprung from the idea of one person, INTIÑAHUI has become a visualized artwork by means of interaction and teamwork. Thomas Siegl was the first to join the project in respect to animation, followed by Martin Schemitsch in 2003. Both of them specialize in the field of 3D imagery. Elmar Ranegger took on montage and post production responsibilities. Prior to that he and Schrefler already had worked together on the double screen video “Rhythms of Violence” (2001). Walter Brantner, alias Dr. Nachtstrom, composed the electronic score. 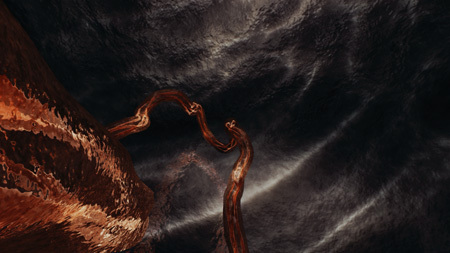 He found his inspiration in the film's imagery itself, but like the two animators was influenced by Klaus Schrefler's sketches as well. Georg Brandenburg became responsible for project management. In 2004 Luis Viracocha traveled all the way from Quito to Graz in order to appear in performances and to create a marble sculpture in teamwork. In the spring of 2002, the first storyboards were developed and began to be realized in the fall of that same year. By the time the DVD was to be finalized the project had grown on a grand scale by Austrian standards in both organisation and effort. Render time for over 500,000 visual elements used in INTIÑAHUI added up to roughly 15,000 hours. the sun bears life – life creates beings. in a world characterized by polarities. to life itself, especially to the life and the knowledge of all indigenous peoples still unfree.